Due to recent events we think it's time to deal with additional Mods on the Server. 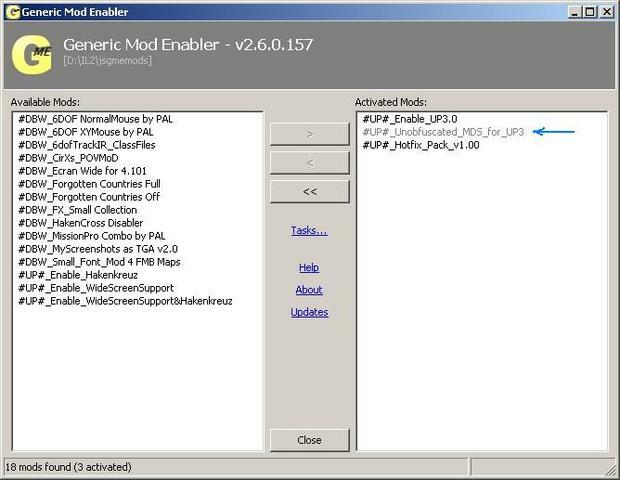 Below you can see a list of tested Mods which are safe to use. We advise you to install the "Recommended" Mods, but it's no Problem (for us or the Server) if you don't have them. The "Certified" Mods are completely optional. This list is not complete yet; we will add more "Certified" and "Recommended" Mods in the future. Do you have a mod from which you think it is safe to use? Please add a link to the Mod's release thread in your reply! Any suggestions without a link will be ignored! -If I have understood correctly, I have to have this in "JSGME" with "blue arrow" in opaque? Opaque is okay because Unobfuscated MDS and Hotfix Pack 1.00 share a couple of classes, so in case you would want to disable Unobfuscated MDS, you would have to disable Hotfix Pack 1.00 first. To keep you from forgetting that step, JSGME turns Unobfuscated MDS opaque as long as the Hotfix Pack is activated. Fixes lag issues on missions which put heavy stress on the server, fixes Spawn issues with Swordfish planes and introduces a new Typhoon model based on crazyflak's family upgrade (http://www.sas1946.com/main/index.php/topic,26690.0.html), fully skinnable with new 3D, yet compatible with "stock" UP3 RC4. Could you eloborate this a bit? Which file exactly, the whole pack has to be downloaded? Maybe I'm corrupted today. So, I can keep all previous files installed, only this one is new? ..and the old one has to be disabled before install, of course.. If you installed this Hotfix Pack, now deactivate it (via JSGME) and activate the latest version of the UP3 RC4 Patch Pack. All the other Mods listed above have not been changed in any way. Thanks skylla. I only use the mods listed in the first post then now and will activate the new Patch pack as stock online packages. The Patch Pack got updated again! For changes, files and the readme, please follow the link in the first post! Ghost129er's Weaponry Sound Pack has been added to the Certified Mods! We're now on Version 103!